Shawn Porter’s works are derived from observation, developed by idea, and realized through a mastery of diverse materials and technique. The physicality of his installations capture the viewer with an aesthetic composed of formal elements and a playful taste for pushing the boundaries of material, balance and weight, holding an individual long enough for reflection of self, structure and society. 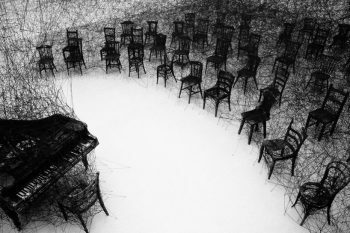 The artist he loves is Chiharu Shiota, whose works inspire his “through the way she pushes the volume of space with seemingly minimal use of object and color, that is, if you consider using miles of yarn (red or black) a minimal approach to pushing the volume of a given space,” says Porter. Porter describes her works as large and loaded with tension. “Although I don’t pull visual reference from her work, on a basic level, Shiota has inspired me to work larger, more densely and with an increased imposition on the viewer, offering small spaces to hide, sit or lay; space for respite. “Her use of familiar objects like chairs, beds and pianos load these installations with metaphorical reference, reminding me of “Play Response and Progression of the Formless” the Co-Lab installation done with Ron Russon [for Artists of Utah at Poor Yorick Studios in 2015]. “Although we used a ladder in that installation it had no metaphorical reference, it was just there and we began playing with it as structure for material support, structure for play, metaphoric development was entirely up to the viewer. The experience at Co-Lab pushed me to play with materials, objects and space; this combined with the inspiration from Chiharu Shiota’s ability to push volume makes me want to play harder,” says Porter. During the month of February we ask Utah artists about a specific piece of art or artist, living or not, local or global, that has sparked their curiosity or influenced their work. We run their responses throughout the month.